Oct 4th was one of the rare days I didn´t melt anything. Or I think I actually threw in a few samples from TBG or so later in the afternoon but I don´t know what scents they were as the samples are over pours and don´t come labeled. -CFTKR Pink Sugar Vanilla Bean Noel in my 20W hot plate warmer in the 1st floor. In my opinion CFTKR tarts don´t do well in any kind of warmer except for the 24W plates where they really throw super strongly and last quite a few hours. in the 20W plate I got a light-medium scent throw and it was such an amazing scent. I could detect both the Vanilla Bean Noel and the Pink Sugar. Next time I´ll use my 24W plate though! -Three Sisters Soap Raspberry & Lemon Verbena in my tealight warmer in the kitchen. This was a super strong tart with a really good throw. A nice fruity fresh scent. -Pics, Petals & Scents Mulberry Zucchini Bread (2 bars) in my 20W hot plate in the living room. This was an awesome scent! The zucchini bread didn´t really come out a lot but the mulberry was pretty strong and it was a really unique fruity scent. It lasted all day long and had a good medium-strong throw. 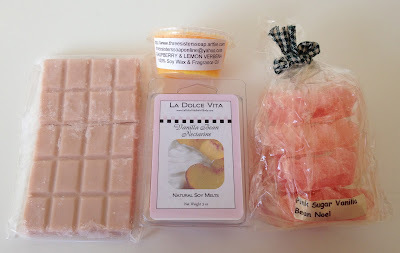 -La Dolce Vita Vanilla Bean Nectarine (2 cubes) in my 24W hot plate warmer in the living room. This was my favorite of that day, such a unique and wonderful scent! The VB scent was quite strong in this one (as it´s normally pretty subtle) and the sweet citrus note of the nectarine just matched perfectly. I am going to order multiples of this to have some stock at home!